If you want a shampoo that lathers into big bubbles and smells like fruit and flowers, you can head over to your local Walmart; but if you can look past those things for a shampoo that gives you the healthiest, shiniest, most natural hair you've ever had, Renovo is a must. Renovo is an all-natural line of hair and skin products based out of Pittsburgh that launched just this past September. Their mission is to make high quality beauty products that are safe and sustainable for both the environment and your body. I tried out Renovo's "Natural Hair Care Kickoff Kit" that comes with samples of two types of shampoo, "Y1 cleansing detox" and "X1 moisturizing," and two types of conditioners, "Z1 repairing protein" and "X1 leave-in." They come in sleek, black bottles, and initially I was a little confused about how the products were named (why are their two X1s?). The letters and numbers went over my head, but I stopped overthinking it and moved on to the instructions before hopping into the shower. The kit includes a handbook with tips and tricks as well as a flow chart of which products to use for your hair type. Per their suggestion, I started with Shampoo Y1 (the cleansing detox shampoo) and Conditioner Z1 (repairing protein). The shampoo and conditioner are runnier than your average drug store shampoo because they lack sodium laurel sulfate, the chemical that makes most shampoos lather (and consequently dries out your locks). When I washed and conditioned my hair in the shower, I wasn't sure how I felt about the products just because they're so different than what I'm used. However, after my hair dried - wow! - what a difference. Usually my hair is staticky and frizzy when it's freshly washed, but after using Renovo my hair was left sleeker, shinier, and just as clean as from my old shampoo. My only disappointment was that on my hair's second day (I wash my hair every other day) it did seem a bit more oily than usual. The Renovo pamphlet said it can take three to four uses for your hair to get used to its new routine, and after about a week of use, my hair was way less oily, probably because my scalp didn't need to produce excess oil to counteract my old over-drying shampoo anymore. Since the Y1 shampoo worked so well for me, I didn't try the X1 moisturizing shampoo, but I did use the X1 leave-in conditioner, which was deeply moisturizing for the ends of my hair and smells like mint. 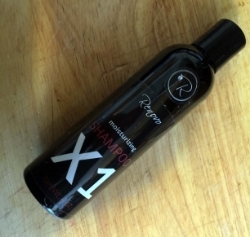 Renovo really has a product for everyone - they even have a Z1 shampoo coming in 2016 that's formulated for oily hair.